Bride Ashley Griffeth and her bridesmaids stretching before the race. 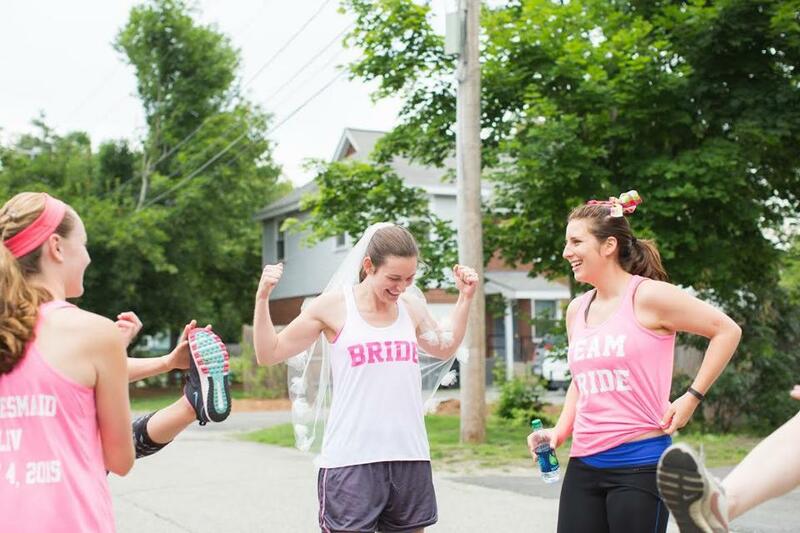 On the Fourth of July, Needham residents Ashley Griffeth and Brendan Mackoff went the distance for their wedding day, a full 5 kilometers. The couple ran in the Charles River YMCA Independence Day 5k and tied the knot that same afternoon. 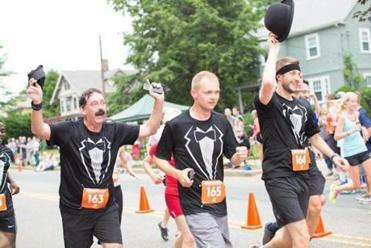 The 16-person running team, registered as “The Wedding Crashers,” consisted of Mackoff, his groomsmen, father, and two uncles along with Griffeth and her bridesmaids. “The race was awesome, we were able to stay with our bridal parties the entire time, so no one got separated,” said Griffeth. The bride and groom managed not to lay eyes on each other throughout the race — thanks to the vigilance of their bridesmaids and groomsmen — albeit there were a few close calls, Griffeth said. Griffeth ran with a veil adorned with tulle flowers made by each of her third-grade students. This was her first class in Needham and many of her students, along with some of her future students for next year, were there to cheer her on. Griffeth wore a white tank top with “in it for the long run” on the back, while her bridesmaids ran in pink tank tops. All the groomsmen ran in tuxedo running T-shirts. Mackoff, who grew up in Hopkinton and will soon start as product manager at TripAdvisor, also wore a top hat. The back of Mackoff’s shirt read “Get me to the church on time,” an homage to his late grandfather who owned a house along the original race route and started the family’s 30-year tradition of running in the race. While this was the third time the couple had participated together, Griffeth and Mackoff said this particular race was about family and tradition, as opposed to a fast race time.